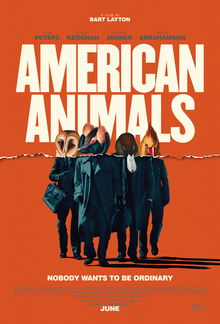 American Animals is a 2018 British crime drama film written and directed by Bart Layton. 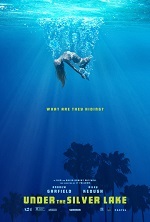 It stars Evan Peters, Barry Keoghan, Blake Jenner, Jared Abrahamson, Udo Kier, and Ann Dowd. The film is based on the true story of a library heist that happened at Transylvania University in Lexington, Kentucky in 2004. It premiered at the 2018 Sundance Film Festival on January 19, 2018 and was released on June 1, 2018, by The Orchard and MoviePass Ventures. American Animals is a captivating fusion of documentary and feature-reconstruction of a real world heist. But it is more than just a heist film. It succeeds in blowing away the cobwebs of convention to really focus on the psyche of these four lads, while simultaneously re-enacting step-by-step the events and repercussions of their risk-filled plot. All of the performances are top drawer, but I would like to draw attention to Barry Keoghan, who is notably authentic. He carries himself as a young Joel Edgerton. Such a fine actor. It's just a superbly crafted film, with a really engrossing soundtrack and story - you deliberate each hurdle with these guys.